Glimmerglass’ 2014 season presents three “beloved audience favorites after each underwent several revisions” and a revised version of a recent premier. All four productions can be seen in one weekend during August in the ideal acoustics of the 900-seat Alice Busch Opera Theater. The newest piece is Tobias Picker’s opera “An American Tragedy,” based on Theodore Dreiser’s 1925 novel, commissioned and first presented by the Metropolitan Opera in 2005. Dreiser added a wealthy love interest (Sondra Finchley) to the real-life story of Chester Gillette (Clyde Griffiths in the novel and opera), a poor factory worker in upstate New York with no assets but his good looks, who was convicted of murdering his pregnant lover Grace Brown (Roberta Alden) in 1906 and executed in 1908. The shorter revision heightens the personal drama of the three principals but loses some of Dreiser’s broader focus on class. 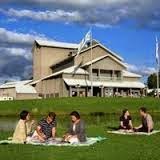 Most of the cast are current or past members of Glimmerglass’s impressive young artists program. Baritone Christian Bowers was a suave and callous heartthrob as Clyde, while soprano Vanessa Isiguen was a poignant Roberta and mezzo-soprano Cynthia Cook an aristocratic Sondra. Veteran opera conductor George Manahan led an incisive account. Like “Tragedy,” Francesca Zambello’s delightful production of Strauss’s “Ariadne in Naxos” was reset from central Europe to a barn in upstate New York, where a burlesque troop and an opera company must provide simultaneous dinner entertainment. Featuring local children and farm animals, the cast was headlined by soprano and 2014 artist in residence Christine Goerke, who was a hilarious Prima Donna and a ravishing Ariadne. Soprano Rachele Gilmore was lively and moving as burlesque queen Zerbinetta, and Kathleen Kelly conducted a vibrant rendition. But Puccini’s “Madame Butterfly” offered the breakout performance of the season in soprano Yunah Lee’s elegant, heartrending portrayal of Cio-Cio-San. Young artist mezzo-soprano Kristen Choi was a compelling Suzuki, and tenor Dinyar Vania as Pinkerton and baritone Aleksey Bogdanov were other cast standouts. The leadership of Festival music director Joseph Colaneri and the stark sets by Michael Yeargan were cathartically effective. A dark and dramatic production of Rodgers and Hammerstein’s “Carousel” (which conductor Doug Peck notes that Rodgers instructed his orchestrators to “treat as his own Puccini opera”) completed the Festival line-up. Bass-baritone Ryan McKinny, last year’s riveting Flying Dutchman, was an equally riveting Billy Bigelow, with a strong Julie Jordan from soprano Andrea Carroll and a brilliant Carrie Pipperidge from young artist soprano Sharin Apostolou. Such nearby attractions as the Baseball Hall of Fame, scenic Otsego Lake, and the Fenimore Art Museum, this summer featuring tie-in exhibitions on Madame Butterfly’s Japan and the Gillette/Brown case, offer worthwhile diversions from the ample Glimmerglass schedule.